In 2007 the regional legislature approved plans to dig up the remaining town to get at some 50 million tons of lignite, or brown coal, to supply a nearby power station. 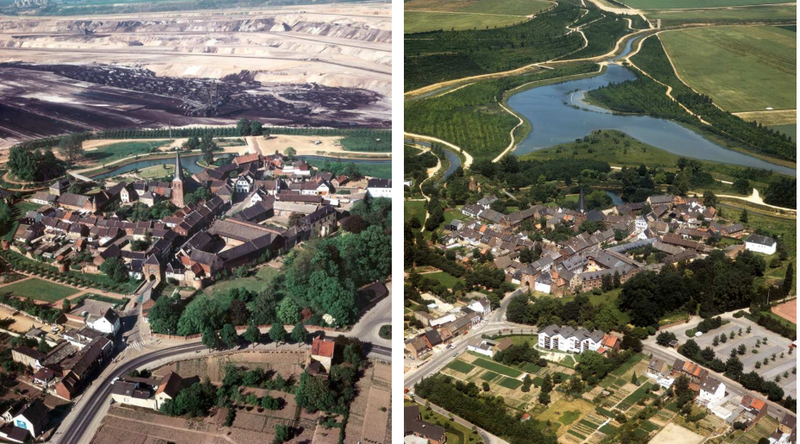 Village authorities fought the plan for years but lost their appeal in Germany’s Constitutional Court in 2005. Most of Heuersdorf’s 320 residents were resettled, most of them farmers and/or retirees. In addition to individual compensation, one important fact deserve to be remarked. An important element of the local cultural heritage was also relocated: a 700-year-old Romanesque-style stone church. As part of the negotiations, the Mibrag mining company spent $4.2 million to move the church from their original location in Heuersdorf to the near town of Borna. Die große Reise einer kleinen Kirche; The long journey of a little church” (2007). Leipziger Universitätsverlag. Leipzig. Conversation with Prof. Dr. Sigrun Kabisch, Head of the Department of Urban and Environmental Sociology, Helmholtz-Zentrum für Umweltforschung (UFZ). Bellow it is showed the three types of communities (Kabisch, 2004) adjacent to the coal mine, now pit lakes, in the southern leizig. These communities are characterised by a relatively large proportion of farmers and farming employees, the other inhabitants working in the mining industry. The level of qualification is relatively low, while the average age is relatively high. Others: out-migration of younger, well-educated inhabitants during the last few decades. The main burden affecting these communities was their classification as “mining protection areas”. Although this classification was abolished after 1990, the local population suddently had to face new worries such as unemployment and early retirement. Suburbs: Markkleeberg-Ost, Grossstädteln: hight satisfaction with the local housing conditions regarding the apartment, very high satisfaction with the local living conditions (share of respondents who would recommend a good friend to move to their community), quiet location, close to the city of Leipzig, varied infraestructures, good transport links, close to future recreation area. Relatively high level of qualifications and higher household income among the inhabitants. Urban morphology: detached family housing. Most of the employees work in the city of Leipzig. Consequently, the collapse of the brown-coal industry did not affect these inhabitants to the same extent as the residents of the other community types. No out-migration tendency. Small towns affected by industry: Gaschwitz (671 inh. in 2014), Grossdeuben, Rötha (3,704 inh. in 2014), Espenhain (2,267 inh. in 2014): Low satisfaction with housing conditions, very low satisfaction with the local living conditions (share of respondents who would recommend a good friend to move to their community), close to the city of Leipzig, good transport links, poor infraestructures, vehicle pollution, devastated landscape, buildings in bad state of repair. TOTAL POPULATION: APPROX: 7.000 inhabitants. Most of the inhabitants worked in the former brown-coal industry. The majority of the residents rent flats in three-or four-storey blocks owned by the industrial enterprises. In this small towns, the collapse of the brown-coal industry led to social disaster, with unemployment suddenly mushrooming. High unemployment has persisted, despite the migration of sections of the population. Kabisch, S. (2004). Revitalisation chances for communities in post-mining landscapes. Peckiana, 3, 87-99. Shrinking mining cities — once prosperous settlements servicing a mining site or a system of mining sites — are characterized by long-term population and/or economic decline. Many of these towns experience periods of growth and shrinkage, mirroring the ebbs and flows of international mineral markets which determine the fortunes of the dominant mining corporation upon which each of these towns heavily depends. This dependence on one main industry produces a parallel development in the fluctuations of both workforce and population. Thus, the strategies of the main company in these towns can, to a great extent, determine future developments and have a great impact on urban management plans. Climate conditions, knowledge, education and health services, as well as transportation links, are important factors that have impacted on lifestyles in mining cities, but it is the parallel development with the private sector operators (often a single corporation) that constitutes the distinctive feature of these cities and that ultimately defines their shrinkage. This article discusses shrinking mining cities in capitalist economies, the factors underpinning their development, and some of the planning and community challenges faced by these cities in Australia, Canada, Japan and Mexico. 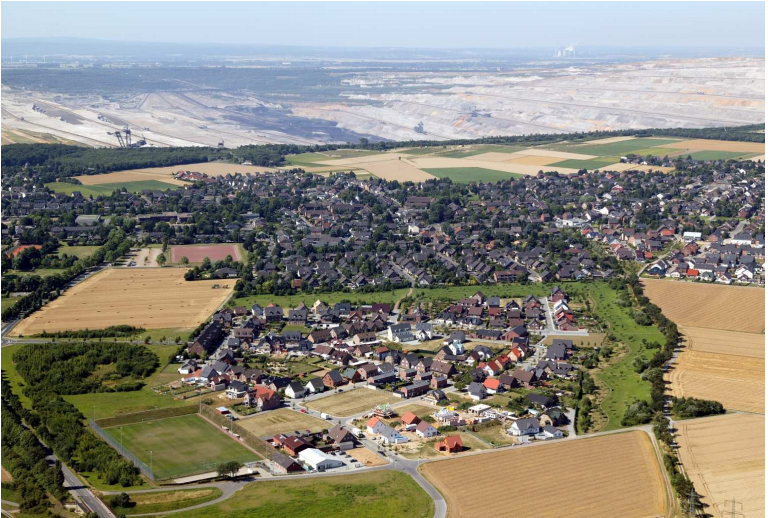 Open pit located in Elsdorf is a town in the Rhein-Erft-Kreis, in North Rhine-Westphalia, Germany. It is situated approximately 5 km south-west of Bergheim and 30 km west of Cologne. The Marta harks back to better times. This locomotive, built in France in 1884, should be pulling a period train right now, taking tourists through the Valley of Guadiato (Córdoba) and reverting the economic decline of this mining area. In 2008, the Socialist mayor of Peñarroya-Pueblonuevo, Luisa Ruiz, presented the train project and claimed it would be operational by 2011. The Industry Ministry funded the restoration with a 1.4 million-euro subsidy – and that was just for phase one of the project. The money came from the Miner Plan, a fund for the economic reconversion of mining areas following the decline of coal. The Guadiato Valley tourist train was going to create 10 jobs, at a total cost of 14 million euros. But these days, the Marta is gathering dust inside a municipal warehouse, itself a vestige of a time when the French Mining and Metallurgy Society of Peñarroya (SMMP) extracted coal out of this mountainous area in Córdoba province. There is no longer any mining activity in the town and coal production in the province as a whole has dropped from 1.1 million tons in 1997, when the subsidy plan began, to 520,000 tons in 2010. But there are no alternatives. Peñarroya-Pueblonuevo, which is now governed by the conservative Popular Party (PP), says there is no money to complete the train restoration, and officials have filed a complaint with the Civil Guard over the alleged wrongful use of the mining subsidies. Three arrests have been made and around 10 people are under scrutiny in a court investigation into the case. The Civil Guard has also expanded its investigation to other mining subsidies in Peñarroya. Not far from the warehouse that holds the Marta, there is a residence for people with psychological disabilities. It was built by the city using three million euros in mining funds. Construction work was completed in 2010, but the building is empty: there are no patients and no caregivers. The grey, modern-looking center sticks out like a sore thumb among all the classic stand-alone homes that housed the French engineers a century ago. On the outskirts of town, there is yet another example of a useless investment of public funds. Inside the Antolín III industrial park, the only green shoots in sight are those growing on the brambles that cover the lots. Not a single company has ever settled down here. Next door is a tire recycling plant that also received financial support from the Miner Plan, but subsequently shut down. There is graffiti on the walls about employees not getting paid. Peñarroya-Pueblonuevo, a town of 11,000, has received around 26 million euros from the Miner Plan over the last 15 years. The current mayor, María Gil of the PP, says she cannot comment on the ongoing investigation. The former mayor, Ruiz, who was arrested and released but still faces charges, declined to talk to EL PAÍS for this story. The recycling plant and the residence both sport a sign with the emblem of the Institute for Coal Mining Restructuring and Alternative Development of the Mining Regions, an agency that answers to the Industry Ministry. Since the late 1990s, this government body has showered millions of euros on Spain’s mining areas. Figures to 2006 (the latest year available on its website) show that 227.9 million euros was spent on building industrial parks. Many of them have no tenants. Meanwhile, the number of coal miners has declined from 50,000 in the 1980s to around 5,000 today. During that time, coal production fell from 36 million tons to six million tons in 2012. 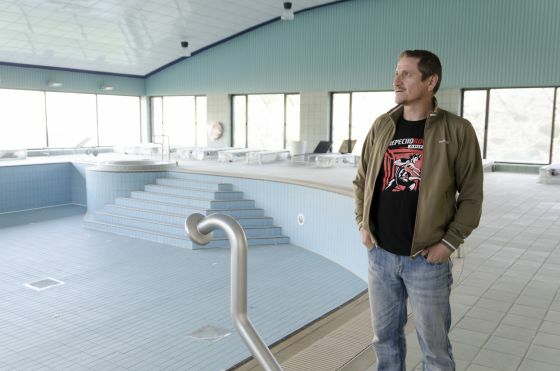 Some 750 kilometers from here, in Teruel province, a small town called Andorra built an industrial park made to measure for two businesses that were going to create much-needed jobs for its 8,000 residents, following the closure of the mines. The companies set to open here were a cement plant owned by the multinational Cemex and a branch of Castelo, a maker of prefabricated architectural elements. On a recent day, a loud group of construction workers were taking the Castelo plant apart – it was operational for no more than a few months. Metal parts are scattered around the red-and-white building that briefly contained state-of-the-art facilities. Meanwhile, the cement works cost 84 million euros to build (of which seven million were subsidies) and currently employs a maintenance crew of two. The plant never actually opened. 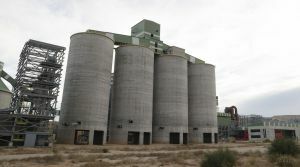 A Cemex spokeswoman said that, given the situation, there are no current plans for this concrete giant. Andorra has had no mines since 2005, but it continues to live off coal. And it has failed to find alternative activities despite the public funds. The cement works was stillborn, and the dozen or so businesses that went up with public money have all left. The industrial park of La Estación, so named because it is located in the same place where the coal-filled wagons used to stop, has become a training field for all the local sports clubs. Of the 22 billion euros in public funds handed out to the mining sector since 1990, according to the Industry Ministry, most has gone to mining companies and early retirement packages. But the 2006-2012 coal plan also financed “the transition of mining areas toward economic activities with greater added value and greater quality of human resources.” This involved investing 250 million euros a year in infrastructure (including new industrial parks) and 150 million for entrepreneurial projects. All sources consulted by this newspaper agreed that the project has met with little success and lacked proper oversight. Most of the companies shut down after receiving the subsidies and having remained open for five years, the minimum required by the Plan to ensure the money does not have to be returned. The solar panel maker Cel Celis opened in 2010 after a 35-million-euro investment (six of which was public money). The inauguration was attended by the deputy premier of the regional government of Castilla y León, Tomás Villanueva. On January 19, the Industry Ministry published a note in the Official State Gazette indicating that it was revoking the aid. The decision was published here after authorities found it impossible to contact the company, which is still operational although production has ground to a halt. No solar panels are being sold. The same issue of the gazette included 15 other cases of subsidies that were being revoked from Teruel-based businesses whose managers could not be contacted. There was a ham de-boning firm (400,000 euros in aid), a three-star hotel that was never built (393,000 euros), and a sausage factory that only functioned for two years (527,000 euros). In the last year alone, the ministry has opened inquiries on around 100 companies whose owners have gone missing, and who had either received or were set to receive a collective 50 million euros between 2007 and 2010. “It doesn’t make any difference whether [the authorities) ask for their funds back; those are limited corporations that have already disappeared,” warns José Luis Villares, secretary of mining for CCOO, who admits that the re-industrialization of mining areas has failed to work. There are infrastructures, decent roads that reach remote locations and industrial parks around every corner ready to accept new corporate tenants. But there are few actual jobs. Magadán insists that the program was not poorly designed, but it just failed to work because of the crisis and the energy policies of the PP government. “The wind energy firms once employed thousands of people in León and now they barely have a few hundred workers,” explains this 49-year-old who spent a quarter of a century working in a mine. He adds that it is not easy to attract businesses to geographically isolated locations. The following are some of the failed projects that received millions of euros in funding from the Industry Ministry to transform the economies of mining areas. – Six million for solar panels. The Cel Celis solar panel manufacturer opened in 2010 in San Román de Bembibre (León), after an investment of 35 million euros (six million of which came from the Miner Plan). The company is now negotiating with creditors to avoid filing for bankruptcy. On January 19, the Industry Ministry announced in the Official Gazette that it was initiating proceedings to revoke state aid from a company that was originally going to create 150 jobs in the area. – 3.5 million for medicine. In 2002 the ministry approved 3.47 million euros in aid to the pharmaceutical company Diasa Pharma, which was going to invest 8.67 million in a new plant in Turón (Asturias), providing jobs for 90 people. The company committed to maintaining those jobs through to October 2010, but in May 2009 it had a meeting of creditors and is already being liquidated, according to the local press. – 31 million for a photovoltaic plant. Silicio Solar, a unit of a Ukrainian company, received 20.9 million euros in 2007. The plant, which was located in Puertollano (Ciudad Real), also secured 10 million in regional funds released by the Economy Ministry. It became the largest photovoltaic manufacturing plant in Spain, with nearly 500 employees. Industry sources said it shut down last December. – 2.1 million for prefabs. In 2009, the Galician company Castelo, which makes prefabricated architectural elements, opened up its most modern plant in Andorra (Teruel) and shut it down in December 2010. It received 2.1 million euros in aid in 2007 and only created 25 out of the 100 jobs it promised. Geijo speaks inside a restaurant near the A-6 motorway, a favorite stop for truck drivers. Brañuelas never had any mines, but it did have the train station for the coal that came out of the mountains. Geijo, a Socialist, recalls that the mining funds allowed him to build a seniors’ residence, a business incubator and an industrial park. The only tenant in it is a company owned by Magín Fernández Feliz, 63, who treats granite and slate for use in cemeteries and roofings. “I didn’t get Miner funds, and I almost prefer it that way,” he says. Although he once had up to 12 workers, the staff is now down to himself and his business partner. But Fernández Feliz hopes that an upcoming deal to send slate panels to Germany will reactivate production. “What should be getting reconverted around here are the people, rather than the region. The miners are retiring early with good pensions and they don’t like to take any risks. They pay for their children’s studies and help them leave the area, but they don’t invest their money. If someone wants to get this land back on its feet, it’s got to be us – we can’t wait for the Japanese, the Germans or the Americans to come do the harvest in our place,” he says. The region of Aragón has received 350 million euros in state funds for infrastructure and 76 million more for business ventures over the course of 15 years. The regional industry commissioner, Arturo Aliaga of the nationalist Aragonese party PAR, says matters have been conducted “exquisitely” and blames the crisis for wiping out the businesses that came to Teruel through the Miner Plan. In Ariño (Teruel), with a population of 900, it has been 10 years since the first stone was laid for the spa that was going to turn the local economy around. But the wellness center was never finished, and the village is still dependent on coal. Mayor Joaquín Noe goes down to the mine every day. Carlos Luna, a Socialist councilor and a miner until he recently retired, still has his hopes pinned on the spa project, which is supposed to employ around 30 people once it is up and running. “The Miner Plan was not shared out properly; it was every man for himself, and things can’t work that way,” he says. The subsidies are handed out by a group of around 20 individuals representing the regional and local governments and the unions. This group, known as Mesa de la Minería, meets at the request of the regional government, after projects have been run through a technical committee. Naturally, not all subsidized companies have collapsed. Casting Ros, in Utrillas (Teruel), makes auto parts and has become the driving force in the region. In this case, subsidies – including some from the Miner Plan – were essential to its survival. In 2008, Casting Ros had 500 workers, but a drop in production has reduced the staff to around 300.